SACRAMENTO, Calif. — A study by a distinguished group of university economists, released Wednesday at a Capitol news conference, contradicted recent claims by the California State Department of Finance that unfunded healthcare costs would be greater than the entire state budget, or at least overwhelm it. The State Senate Appropriations Committee analysis for S.B. 562, The Healthy California Act, declared the bill would cost $400 billion annually. With between $300 billion to $350 billion currently available expenditures, finance staff noted a shortfall of $50 billion to $100 billion. However, there were no firm details in the state's financial analysis supporting these claims. 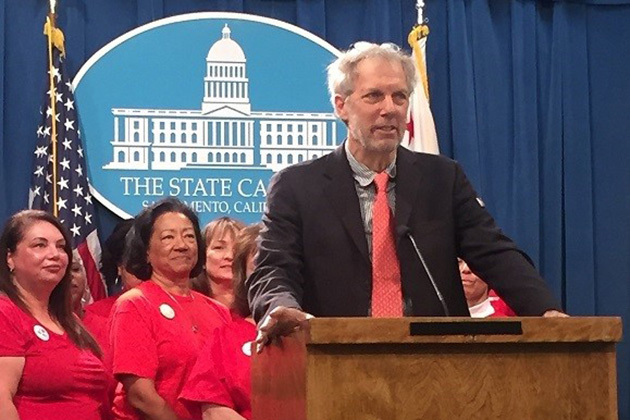 "The Senate Appropriations analysis was wrong," California Nurses Association policy consultant Michael Lighty chimed in. Pollin said nearly $370 billion is already being spent on healthcare in California. Of 33.5 million Californians with health insurance, 12 million are underinsured, and 2.7 million are without any health insurance at all. His research group calculated that a 15 percent increase in payments were needed to repair system problems for the underinsured, and a 50 percent increase was needed to cover those without healthcare. Collectively, under the current health insurance scheme, costs would increase about 10 percent, from $370 to about $400 billion. Pollin noted that savings came from structural changes and applied efficiencies. Structural savings came from decreased administrative costs, and as much as a 30 percent decrease in drug costs, according to the Veterans Administration and the Canadian national system. Further savings came from applying Medicare fee structures for providers. Such structural changes total 13 percent in savings. Inefficiencies in the current system constitute the second area of savings. The report lists unnecessary services, fraud, inefficient deliveries of healthcare services and missed prevention opportunities. Pollin said he assumed a 5 percent savings in this area, a conservative figure gleaned from a 2010 Institute of Medicine report that set those savings at 19 percent. When asked if universal access to healthcare drives up utilization of services, Pollin said that the report considers a 5 percent increase in provision of services. He said that the report "does not adjust downward for acuity of care" as for fewer emergency room visits and fewer unnecessary hospital days for neglected medical conditions. Between the savings changes in structure and efficiencies (about 18 percent), less the increased costs of universal coverage and expansion (almost 10 percent), the new health bill should reduce costs by about 9-10 percent, from $370 to $330 billion. Pollin said public funds constitute 70 percent of California's healthcare expenses, or about $225 billion per year. Therefore, an additional $105 billion is needed. To meet this need, he proposed two taxes: one on gross business receipts (which will raise about $93 billion) and a sales tax (which will raise about $13 billion), both at 2.3 percent. Pollin pointed out two charts at the news conference: households and businesses. He said the bill is a "windfall for middle income families," who will see about 9 percent lower healthcare costs, noting that "wealthy households will pay more" (about 1-2 percent) as they "now get a net subsidy" (about 1 percent) from healthcare expense tax credits. Pollin declared that "small businesses won't have to pay anything" below an exemption level of $2 million gross receipts. Healthcare expenditures will fall for those small businesses that cover their own employees. Poor, MediCal-eligible households will receive a 2 percent tax credit. "This measure is good for businesses ... and good for households," Pollin said. When asked about the study's methodology, Pollin said it was "simple arithmetic," the results of which "should be reproducible." He said the report has "no econometrics yet for spillover effects" of the data. In response to a question about how dental and mental health costs were included, Pollin said the study group used "Medicare fee structures," which are 22 percent below private insurance but 15 percent above Medicaid (MediCal) reimbursement rates. "Dental costs should go down," he said. Nurses' union leader Rose Anne Demoro said that "unnecessary human suffering has propelled this organization" to propose this bill. She said "the national narrative is so horrible ... the Affordable Care Act is unaffordable." Senator Ricardo Lara, who authored the bill, said it's important that Pollin is "friends with the governor." He said it's time to eliminate the "network of limits" that is the current healthcare system. Lara said he is pushing this bill to "combat what is happening in D.C."
The Sacramento Bee highlighted the taxes proposed by the bill with the saturnine headline, "Higher taxes on cars and dining to pay for California health care? Nurses have a proposal." The Bee's editorial board also recently criticized the bill under the headline, "Universal health care for California? In Fantasyland, maybe." Healthcare foundations have active media companies, including Kaiser Health News, which was absent and made no mention of the study on its media page. The California Health Care Foundation granted $110,000 to Capital Public Radio in 2014 to fund a healthcare reporter in Sacramento. There was no mention by the station of the study or press conference.